…so says the sign at the DJ booth. Many years ago, a good friend and I dabbled in the murky world of the music business. Every Saturday we’d meet up in our local pub, sit in our usual spot, have a few beers and rip the pish oot of the DJ and whatever music he was playing. We asked the DJ for bands we wanted to hear – The Smiths, Teenage Fanclub, Spearmint, Beatles, Dylan, Stones and many many more. He never had anything we asked for. So we asked Big Wullie the Manager if we could get a wee slot before the ‘main act’ came on. Surprisingly he agreed, so off we went. Never got paid. Never had a sign – just played whatever we and like-minded souls wanted to hear. Anyhow, here’s the promo CD of ‘All Night’, a disco dance floor stomper of a tune – featuring the brass of Herb Alpert’s ‘The Lonely Bull’ – that implores the DJ to ‘do his job’. No miracle’s going to save this tape I’m afraid. 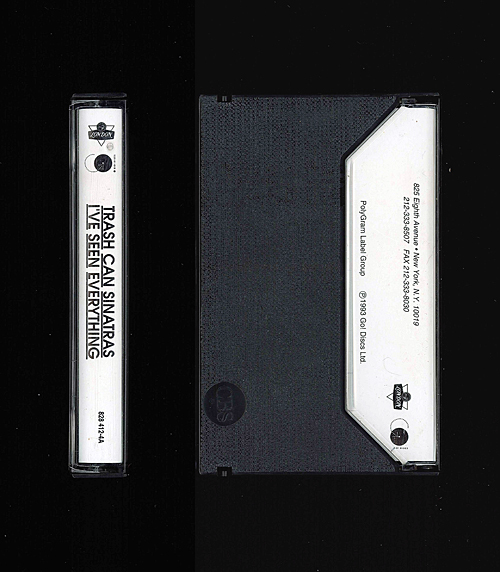 The tape machine seems to have chewed up this old promo copy of ‘I’ve Seen Everything’. Think I’ll stick it back in the cabinet. US 8″ x 10″ promotional black & white publicity photograph featuring a great image of an early Trashcan Sinatras line-up: (Left to right; John Douglas, George McDaid, Paul Livingston, Stephen Douglas and Frank Reader). This photograph, taken by Paul Cox, was used to promote the band during the Cake era. A very early promo cassette from Go! 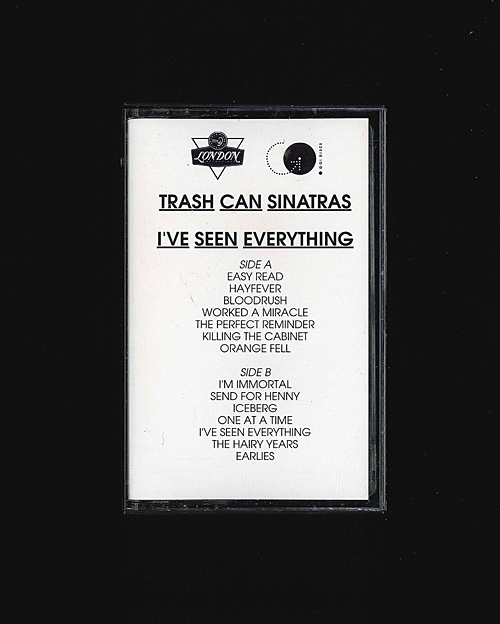 Discs featured the Trashcans’ version of ‘Tonight You Belong To Me’ – a song written in 1926 by lyricist Billy Rose and composer Lee David. The song – widely known for its appearance in Steve Martin’s film ‘The Jerk’ – is a wee bit longer than the original composition and features Frank duetting with his sister Richael. Some copies – like this one – came in a wee metal tin. 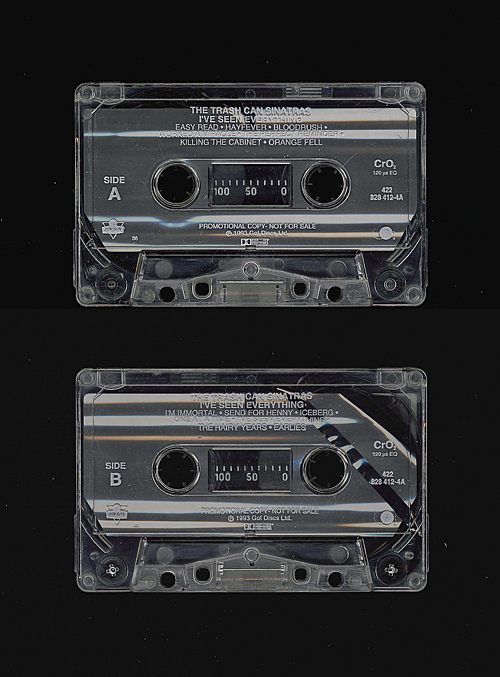 Other artists included on the tape include The La’s, Orbital, Meat Puppets and a personal ‘favourite’, Bananarama.